Anyone one have any idea where I can find one? I know they are hard to find but I grew up shooting one and want one badly. You're going to have to look on the secondary market, i.e. Gunbroker, EE, Armslist etc. Browning/FN has no plans to import the .40 BHP again. I don't have a license to kill, but I do have a learner's permit. Gunbroker is going to be your best bet. There're usually a few BHP .40's listed on there. Great pistol, but getting a holster can be an issue. Leather will stretch enough to fit around the thicker slide but the only company I know of that makes a kydex holster is Comp Tac (I'm very happy with mine ). Best of luck with your search! The bonfire is smouldering, and it is a windy day. What are you going to do? I want a .40 HP badly. 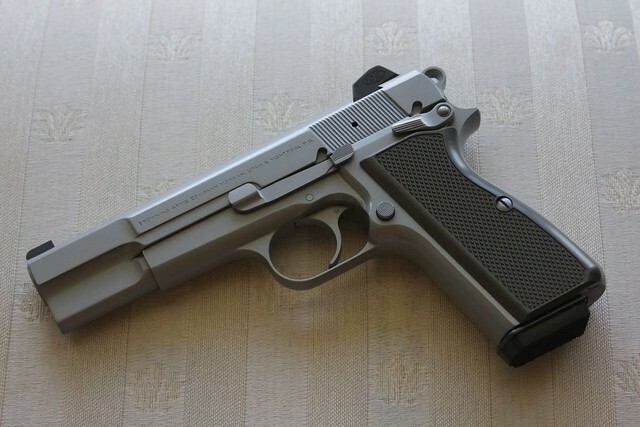 I want to shoot .40, but no hand gun is as comfortable to me as the Hi Power. they are skyrocketing in value since Browning/ FN discontinued them. Your best bet is finding one traded in at a gun store. They used to be a lot less money than a 9mm, now that they are discontinued everyone wants one. I got mine about 8 months ago. I've seen several others from time to time, usually anywhere in the 800-1200 range, depending on extras. CDNN has had them in the catalog for a couple months so far. I was considering to sell my rarely use .40 to get the fund to build an AR-15 in 9mm. With this sad news, I am going keep it. I couldn't find them online, do you have a link? OP are you still looking for a BHP in .40? Not to hi-jack this thread too badly but would anyone have an idea of the value of a .40 hi power with a factory SFS system? No plans to use it in a defensive role so the pros and cons of the SFS system don't really concern me. I found one locally that I think might be a good investment and I'm just looking for a value. They are trading for about $750-$850 give or take a hundred depending on condition and original box etc. Some are going for even more. It's a very limited market. I found one at a local gun store. $650 and has target sights. A real beauty. Didn't buy. A CZ took the $ this time. Maybe someday I can afford one. Just to drop a bomb, if I ever get a 1911, it'll be in .40. "Psychological Manipulation Of The Population By The Federal Government"
Anyone still looking send me a PM, I saw one in a LGS today for $600 bucks with case and 2 mags. Blued with target sights. I love my .40 Practical. I no longer EDC it (Glock took over that role) but it holds a very special place in my heart. I often take it out of the safe and every so often take it to the range, for old times sake. OP, I'm not sure where in MS you are... but if you're on the Coast or close by, the Cabela's in Gonzales LA has a .40 BHP in the Gallery of Guns. Saw it this weekend. Think again. I bought a Colt Defender in .40. Too much pressure, slide goes too fast. Much feeding and extraction problems. Colt tried to fix it X4 and eventually replaced it with a .45 Defender (after much hassle and expense incurred by me). There's a reason nobody makes a .40 1911 now. My off duty 40 HP came from Texas with 5 mags from right here on ar15 for $500. Even with the mag safety still engaged, I can qual the duty cource from under cover in IWB holster as easily as with the issued G22. The other I gave my wife I found in a trade on another site with 2 spring and 3 Mec Gar mags for my Ruger 7.5" 44 Blackhawk. Keep trying and checking, just be ready when one shows up. PS, I found 8 Browning spring mags on E bay advertised as Mec Gar for 15 apiece, so it pays to search. Good luck. BHP 40 is one of the finest shooting 40's made to date.